Join Millions of other volunteers on Saturday for America's largest day of doing good. Celebrate Make a Difference Day by participating in a community project in your local area. 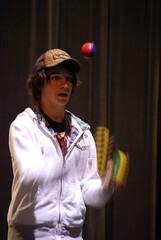 Go to http://www.MakeADifferenceDay.com and learn more about how you can get involved and make a difference. I recently went into the hospital. But it wasn't to get tested or treated. It was to help provide some humor to the patients and staff at Frye Regional Medical Center in Hickory, North Carolina. A volunteer team called Charlie's Chaplains visits their local hospital twice a month. 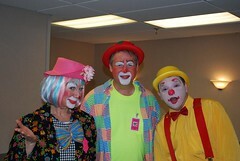 I was excited to be a part of their clown ministry for a day. Before I went, several friends and readers of my blog said that many children and some adults are scared of clowns. Although they said they were supportive, it was clear they were also skeptical. Fortunately, I was able to see and experience it first hand and I had a BLAST (and so did the kids and adults)! The visit was very organized. 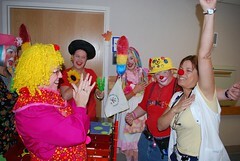 The clowns, magician, and puppeteer/juggler were split into teams and assigned areas of the hospital. Each team had a cart full of props to use for the visits. They met with the staff on duty and visited the patient rooms they were allowed to enter. It was a few hours of jokes, riddles, and performances. Almost all of the patients allowed us to visit with them. What was exciting was to see the smiles appear on everyone's face when they saw us. The smiles were contagious. After telling a joke or funny story, some patients had to tell us one before we could leave. Now that is audience participation! Children visiting a parent or grandparent in the hospital would stick their head out the door and watch us as we made our way down each hallway. Charlie's Chaplains are trained in how to design a "kid-friendly" face and how to approach children for the first time. I saw nothing but smiles and excitement from the kids during the visit. The staff were not left out. A couple of very good practical jokes were played on them as well. At the conclusion of the hospital rounds, the Charlie's Chaplains volunteers spent a few minutes celebrating in the cafeteria. My thanks goes out to Chaplain Ford, Becky Cortino and the rest of the FRMC Charlie's Chaplains team for providing me such a wonderful experience and for making me feel welcome from the start. You truly are making a difference in people's lives. The Sharing Foundation continues to impress me with their creative ways of helping children in Cambodia, raising money and thanking donors. I learned about the Sharing Foundation almost a year ago. Beth Kanter was turbocharging her use of social networking to win a $50,000 contest award for the Sharing Foundation. She asked me to play a part in the promotion and I'm glad I did. In the latest Sharing Foundation newsletter, Dr. Nancy Hendrie (President) discusses a new project they are doing in Cambodia to thank "significant" donors. The Sharing Foundation is in the process of constructing a new girls dorm. One of their resident artists is hand painting a scene on individual bricks. 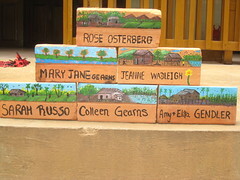 The name of a donor is written on each brick. Then a photograph is taken of the brick and sent to the donor. These bricks will be used in the construction of the dorm and located away from the outdoor elements so the artwork and names will last for years. What a terrific way to say thanks! Think about all the ways these bricks will touch people's lives. If you are a fundraiser or work for a nonprofit, consider using the Sharing Foundation's example and find unique ways to thank donors. It can have a significant payoff that goes beyond just your expression of thanks. Did you ever think about being a clown? I didn't, until I discovered a hospital clown ministry made up of volunteers. 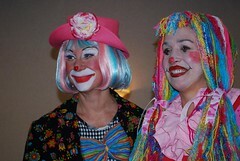 Several weeks ago my clown journey began as I was doing some research on laughter and humor therapy. I met Becky Cortino through a free online class she was teaching on the topic called Healing Humor: Live Happy - Be Healthy! I learned that Becky was also the coordinator for a nonprofit volunteer group of clowns and creative arts performers called Charlie's Chaplains. I was intrigued by the concept of volunteers helping hospital patients and staff by applying the concept of humor therapy. So intrigued, that I traveled to Hickory, North Carolina to participate in their annual clown "skool." Clown Skool was extremely fun and informative. I was even able to see Magic's Royal Duke Sammy Cortino conduct a special performance for us. I met many volunteers who are passionate about performing in the hospital setting. Some of them have multiple personalities. I mean that in a good way! They have multiple costumes and distinct personalities to go with each. 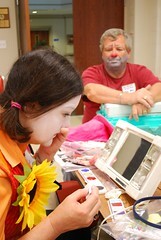 They're generous with their time and talents, bringing smiles to the faces of the hospital staff and patients. FRMC Charlie's Chaplains surprised me by making me an honorary member of their group. I am only the second honorary member since they started in 1991. What an honor and privilege! 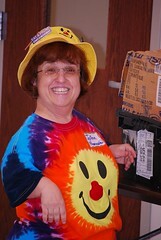 If you have a desire to learn more about participating in a hospital clown and performing arts ministry, let Becky know (Twitter: @BeckyCortino). She has the expertise and materials available to get you started. You can help others when they need a smile the most. When Naperville's Sherilyn Sheets celebrated her 27th birthday Sunday, instead of asking family and friends for gifts or a celebration for herself, she asked them to help her throw a party for homeless people in Chicago. What a great idea! Check out the story for more inspiration.